Last week Utah lost its starting quarterback, Tyler Huntley, after he broke his collarbone in a 38-20 loss to Arizona State. Now, with a redshirt freshman leading the offense, the suddenly unranked Utes look to bounce back against the Ducks. Against the Sun Devils, Utah got down early but was able to battle back to within one, 21-20, entering the fourth quarter. But losing Huntley proved too much to overcome, and because of that the Utes' offense stalled out. Jason Shelley, who took over for Huntley, is expected to start against Oregon. This season, he has thrown the ball 14 times, completing 6 for 99 yards and 1 interception. 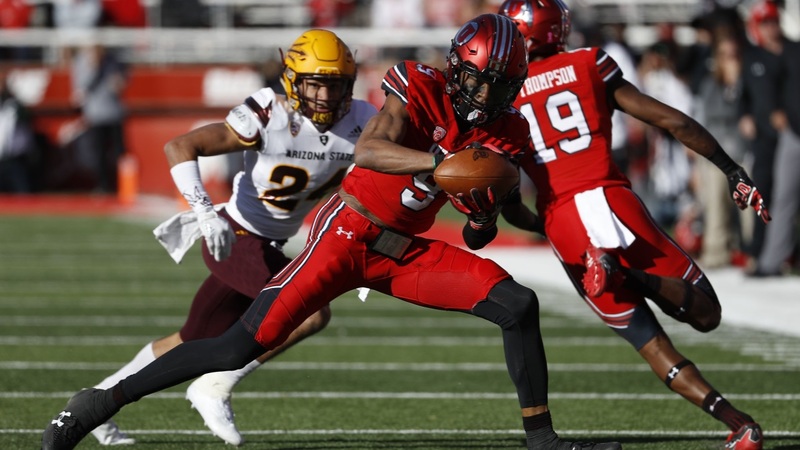 Utah’s running game is led by Zack Moss, who is more than likely playing in his final collegiate season and now must step his game up even more now in the absence of Huntley. The junior is nearing the 1,100-yard mark for the season, and he remains on pace to break Utah’s season and career rushing records. Moss is a solid runner, and his skill level will demand that Oregon’s defensive line and depleted linebacking corps play at the top of their games. Utah has a group of wide receivers that are all OK, but none really stand out as spectacular. Their leading receiver last week was Samson Nacua, who had 4 receptions for 68 yards and 1 touchdown. The wild card weapon is slot receiver Britain Covey, who has caught 50 balls for 555 yards and run 10 times for 88 more. The Utes’ offensive line had an impressive start to the season, but in recent weeks it has really struggled for consistency. With an increased reliance on Moss and a young QB, the blocking will need to be that much better. On a similar note, Oregon’s offensive line is going to have to do some readjusting, because Jake Hanson's targeting call last week means he has to miss the first half of the Utah game. The injury-plagued unit is still working to find the same level of dominance that it had early in the season, and the absence of a veteran center is another obstacle to that mission. The biggest thing that this offense is going to have to overcome is a poor performance in its past two road games, against Washington State and Arizona. The Ducks were able to score only 35 points combined in those games, and a couple of those scores came in garbage time. The mental aspect of football is huge, so putting those two road performances behind them is a big key to victory in Salt Lake City. Justin Herbert and Dillon Mitchell had strong performances in their bounce-back game against UCLA, but the lack of depth at wide receiver is still concerning. The run game, led by CJ Verdell, hasn’t been that explosive in recent games, but it hasn’t been horrible. I think one big issue is the line not creating as many opportunities for Verdell and Travis Dye to exploit. In the end, I have to give the nod on offense to Oregon, because without Huntley I’m just not sure how effective this Utah offense can be. Moss is definitely a threat, but whether he can carry the whole team is yet to be seen.